GER3 reinitiated its Hurricane Matthew Sustainable Tree Recovery program in select communities of Dame Marie, Haiti in early 2018, thanks to a generous contribution from the MacFarlane Foundation. In just under two months the team has successfully cleared over 450 square meters of fallen trees and created 300 wooden planks from recovered wood. The program is estimated to have over 1,000 direct beneficiaries, including workers, landowners and affected community members. In January of 2017, GER3 began the Haiti Tree Recovery Operation in order to help the people of Haiti continue to rebuild their lives in the wake of Hurricane Matthew. With the goal of empowering the local people, GER3 focused on recovering an overlooked, but important, resource: the fallen trees. Hurricane Matthew left 350,000 trees felled. These trees, if harvested before they rot, provide a great source of lumber, and must be cleared in order for farmers to be able to return to farming the land. Hurricane Michael made landfall as a Category 4 storm on October 10th, 2018. With winds recorded over 155 mph and a pressure of 919 millibars, Michael was the most powerful hurricane to ever hit the Florida Panhandle and one of the strongest on record to hit the continental United States. The storm’s path left massive destruction of infrastructure and trees and widespread power outages. Among those most vulnerable to the storm were coastal and rural communities who were unprepared for such strong winds and rain and the resulting destruction. Responding to hurricane Michael, GER3 focused on maximizing impact for a few select families in a particularly vulnerable town. The team supported a local entrepreneur with a small logging business to provide debris removal for families in Blountstown. 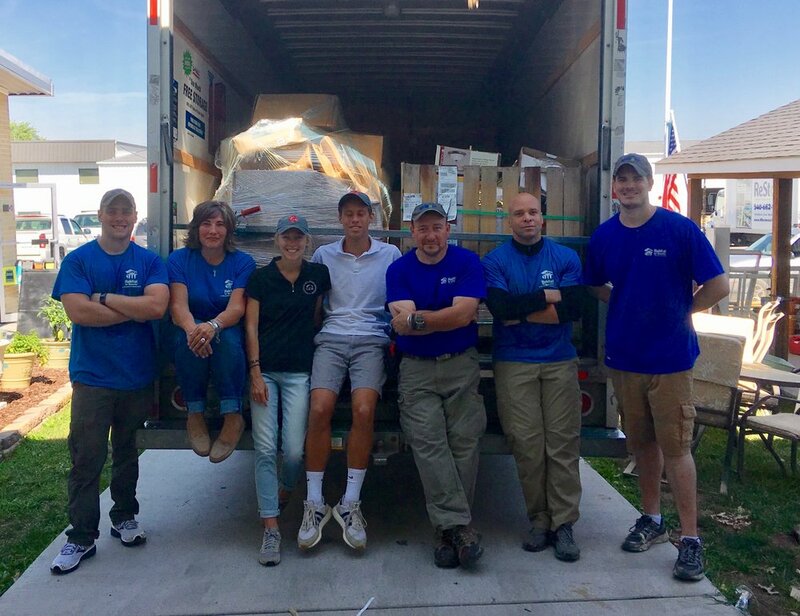 As Hurricane Florence made landfall in North Carolina, on September 14th, a GER3 disaster response team immediately deployed to the region with equipment for relief and recovery. The team, in partnership with J/P HRO, targeted efforts towards critically vulnerable families affected by the flooding in Robeson County, North Carolina. The response included: Muck outs and debris clearance, pumps (for pumping water from homes), dehumidifiers & fans, clean-up kits, and identification and supply of contractors to support with mold remediation. For more details about the specific response efforts, partnerships, and results in Robeson county, please visit the project page. GER3 supported a local chapter of Habitat for Humanity to deliver tornado recovery supplies to Amherst County, Virginia. After being hit by an EF 2 tornado on April 15, the county is still recovering and rebuilding the over 140 houses and structures severely damaged by the storm. Volunteers Margaret and Thomas Bacon helped load a truck provided by GER3 in Winchester and transported the donations to the Habitat in Amherst Country. 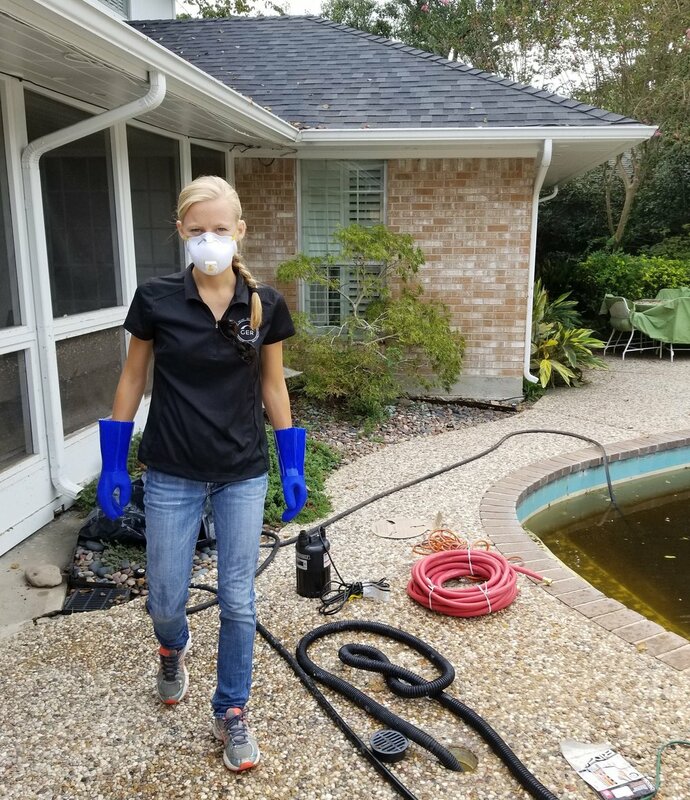 When Hurricane Harvey hit Houston, GER3 sent three response personnel to help the local community recovery their livelihoods. Support included cleaning kits, water pumping services and mold remediation efforts to help affected families return home safely once flood waters had receeded. GER3 volunteers delivered the kits and worked together with families to clean out and disinfect their homes. Disinfectants such as chlorine were extremely important, due to mold and disease-carrying residue that remained as a result of the flood waters. GER3 provided water pumping services to lower standing water from houses, which can create serious health concerns as mosquitos breed other sicknesses develop in the standing pools. Some houses had swimming pools which were also dangerous vector breeding grounds. GER3 partnered with the J/P Haitian Relief Organization St. Croix to conduct an assessment mission in the wake of hurricanes Irma and Maria. The assessment evaluated the needs of US Virgin Islands (USVI) populations as well as the effectiveness of pre-existing response efforts. Over the course of the mission the assessment team was able to talk to over 60 interlocutors in USVI, including representation from the Federal Emergency Management Agency, US Army Corps of Engineers, the USVI government, nonprofit organizations and the private sector. On the morning of September 28th, a magnitude 7.5 earthquake occurred near the central island of Sulawesi, Indonesia, setting off a tsunami and affecting six regencies and up to 85 districts. The devastating earthquake and consequential tsunami left over 2,010 dead and thousands in need of immediate assistance. In response, GER3 deployed a disaster response and recovery team to conduct initial assessments, deliver assistance and design programming focused on debris management and building back better. GER3 targeted support to local communities (households, schools and health facilities) and supported the management of debris and shelter challenges they faced. For more information and photos, please visit the project page. The Waitt Institute has been operating in Barbuda since 2013, working to protect and manage the island's ocean resources through the Blue Halo Initiative. When Hurricane Irma struck Barbuda in the early morning hours of September 6th and left the island decimated and uninhabited, Waitt re-purposed its resources to provide essential relief and recovery services to the Barbudan community. Waitt brought in GER3 representatives to manage the recovery operation on behalf of Barbuda Recovery and Conservation Trust, which has pledged over $500,000 to assist affected populations. GER3 designed two rapid recovery interventions to help the people of Sint Maarten in the wake of the Hurricane Irma. First was the removal of debris and cleanup of the Leonard Conner School in Cay Bay where nearly 300 students and teachers were waiting to reclaim and reopen the school. GER3 also oversaw debris removal from the home of an elderly woman and her disabled daughter on the Philipsburg waterfront. Both interventions were designed in direct consultation with affected communities, the national government, U.N. partner agencies and key operational partner Tzu Chi Sint Maarten.